The Cooper Discoverer A/T3 is a premium all terrain, light truck tire. The Discoverer A/T3 is designed for light trucks and SUV’s and can handle almost any terrain. The Discoverer A/T3 tire has an aggressive tread pattern that performs well on and off road and in wet or dry weather. 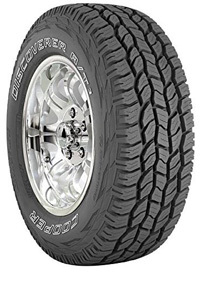 Cooper’s Discoverer A/T3 tire features an all season tread compound and it is mud and snow rated for year round use. The Discoverer A/T3 also features structured sipes that promote even wear and wet traction. Cooper designed this tire with a five rib design that provides traction on and off road. The Discoverer A/T3 tire delivers excellent stability, confident handling and long tread life.